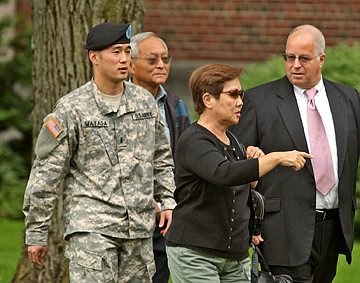 Army 1st Lt. Ehren Watada took a break yesterday with father Bob Watada, stepmother Rosa Saka- nishi and lawyer Eric Seitz at Fort Lewis, Wash. Facing the possibility of a court-martial for refusing to go to Iraq, 1st Lt. Ehren Watada said he has no regrets and is "at peace" with his choice. Watada made his comments after a one-day Article 32 hearing in Fort Lewis near Seattle. His attorney expects that Lt. Col. Mark Keith, the presiding Army officer at the hearing, will recommend a court-martial. "I expect a convening order for court-martial within two or three weeks," attorney Eric Seitz said in a phone interview from Seattle. If convicted, Watada could face more than seven years in prison and a dishonorable discharge. The 1996 Kalani High School graduate faces charges of missing a movement. He also is charged with contempt toward officials and conduct unbecoming an officer. In a phone interview after the hearing, Watada continued to assert that the war in Iraq is both illegal and immoral. "I would not have done it differently," the 28-year-old artillery soldier said about his decision not to go to Iraq. "I am at peace with my decision." Army prosecutor Capt. Dan Kuecker played three video clips of comments Watada made last weekend, as well as on June 7, when he publicly announced his decision to refuse deployment. Kuecker also presented the hearing with Watada's statements to reporters, in which he said he felt the Bush administration deceived Americans in order to initiate the war. In the final video, taken last weekend at the Veterans for Peace convention in Seattle, Watada said it is up to military personnel to stop the war. "It is time for change, and change starts with all of us," he said. He went on to offer the veterans a "radical idea." "To stop an illegal and unjust war, soldiers and service members can choose to stop fighting it," he said. Kuecker contended that Watada's statements against the war, as well as his refusal to go to Iraq, could adversely affect the morale of his fellow soldiers now serving in the Middle East. Watada sat quietly, flanked by his attorneys, Seitz and Army Capt. Mark Kim. His father and stepmother sat in the back of the hearing room. The government called its only witness, Capt. J.C. Kaplan, with the 3rd Brigade, who escorted Watada to his assigned quarters. "He was restricted to post," he said. Seitz said he is not denying that Watada missed troop movement, but also noted that Watada asked to be sent to Afghanistan instead of Iraq, and on two occasions asked to be allowed to resign. All requests were denied. Seitz has said Watada's public disagreement with the war is protected by the Constitution. Seitz's first witness to support Watada's contention that the Iraq invasion violated domestic and international law was University of Illinois professor Francis Boyle, an international-law expert. The war in Iraq, Boyle said, is a war against peace because it was not authorized by the U.N. Security Council. Secondly, he said, Congress approved going to war only after being lied to by the Bush administration about Iraq having weapons of mass destruction and Saddam Hussein's ties to the Sept. 11, 2001, attacks. "This constitutes ... a conspiracy to defraud the United States government," he said. After researching the U.S. invasion of Iraq, Watada has said he determined it to be an illegal and unjust war. Watada made an extensive study of the facts surrounding the war, Boyle said. "The more you know, the higher your rank, the more your responsibility," he said. "If he had deployed, he would be facilitating a Nuremberg crime against peace." Kuecker objected to the relevance of Boyle's testimony, saying the legality of the war is not to be decided by a military court. Under questioning by the presiding officer, Boyle acknowledged that either a U.S. federal court or the U.S. Supreme Court could declare the war to be illegal. Watada said he believed the two witnesses called in his defense presented "a good dialogue on the illegality of the war." Watada's father, Bob, said the hearing went well. "He did the right thing, and let the chips fall where they may," he said. Watada has been reassigned to Headquarters and Headquarters Company, I Corps. Watada enlisted in the Army in March 2003 -- the same month the U.S. invaded Iraq -- and was commissioned later that year. He served one tour in South Korea.